Access: On the Menu bar, click Process > Processing Options..., the Processing Options pop-up appears. Click 2. Point Cloud and Mesh. By default, only the Point Cloud and the 3D Textured Mesh tabs appear. On the bottom left, select the Advanced box to display other tabs. Point Cloud Densification: Allows the user to define parameters for the point cloud densification. Point Cloud Classification: Allows the user to classify the point cloud. Export: Allows the user to select the desired output formats for the densified point cloud. 1/2 (Half image size, Default): Half size images are used to compute additional 3D points. It is the recommended image scale. 1 (Original image size, Slow): The original image size is used to compute additional 3D points. More points are computed than with half image scale, especially in areas where features can be easily matched (e.g. cities, rocks, etc.). This option may require four times more RAM and processing time than when choosing the default value 1/2 (half image size), and usually it does not significantly improve the results. 1/4 (Quarter image size, Fast): Quarter size images are used to compute additional 3D points. Less points are computed than with the half image scale. However, more points are computed in areas with features that cannot easily be matched such as vegetation areas. This scale is recommended for projects with vegetation. 1/8 (Eighth image size, Tolerant): Eighth size images are used to compute additional 3D points. Less points are computed than with the half or quarter image scale. However, more points are computed in areas with features that cannot easily be matched such as vegetation areas. This scale is recommended for projects with vegetation. Multiscale (default): When this option is activated, additional 3D points are computed on multiple image scales, starting with the chosen scale from the Image scale drop down list and going to the 1/8 scale (eighth image size, tolerant). For example, if 1/2 (half image size, default) is selected, the additional 3D points are computed on images with half, quarter, and eighth image size. This is useful for computing additional 3D points in vegetation areas as well as keeping details in areas without vegetation. In some cases deactivating the Multiscale option produces less noise in the Point Cloud. 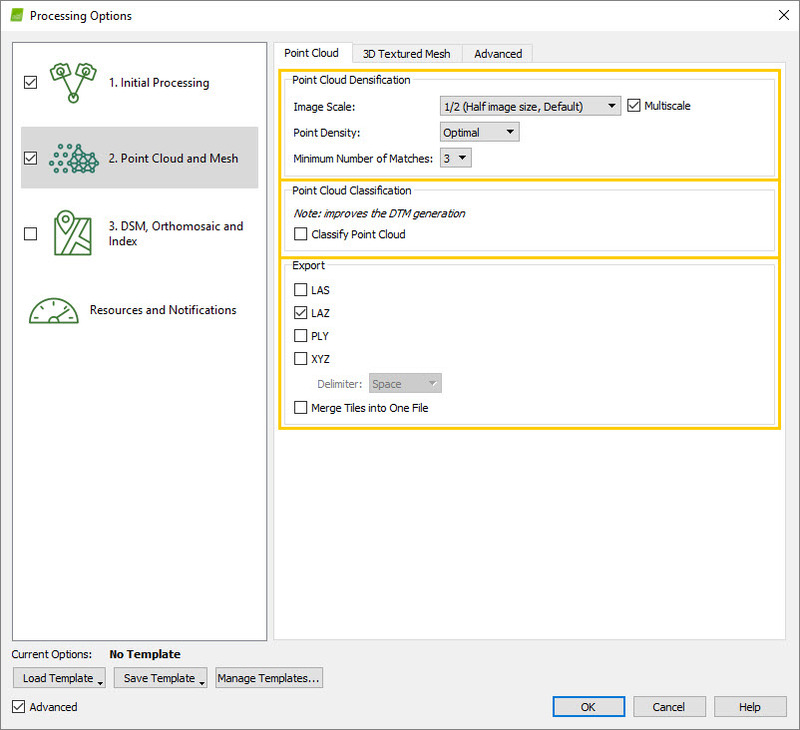 We recommend deactivating this option when a lot of noise is visible in the Point Cloud and artifacts are present in 3D Texture Mesh, DSM or Orthomosaic. Note: The Image Scale has an impact on the number of 3D points generated. For more information: How many Points are generated during step 2. Point Cloud and Mesh?. Optimal (Default): A 3D point is computed for every (4/ Image Scale) pixel. For example, if the Image Scale is set to 1/2 (half image size), one 3D point is computed every 4/(0.5) = 8 pixels of the original image. This is the recommended point cloud density. High (Slow): A 3D point is computed for every Image Scale pixel. The result will be an oversampled Point cloud that requires up to 4 times more processing time and RAM than optimal density. Usually, this point cloud option does not significantly improve the results. Low (Fast): A 3D point is computed for every (16/Image Scale) pixel . For example, if the Image Scale is set to 1/2 (half image size), one 3D point is computed every 16/(0.5) = 32 pixels of the original image. The final point cloud is computed up to 4 times faster and uses up to 4 times less RAM than optimal density. Note: The Point Density has an impact on the number of 3D points generated. For more information: How many Points are generated during step 2. Point Cloud and Mesh?. 3 (default): Each 3D point has to be correctly re-projected in at least 3 images. 2: Each 3D point has to be correctly re-projected in at least 2 images. This option is recommended for projects with small overlap, but it produces a point cloud with more noise and artifacts. 4: Each 3D point has to be correctly re-projected in at least 4 images. This option reduces the noise and improves the quality of the point cloud, but it might compute less 3D points in the final point cloud. 5: Each 3D point has to be correctly re-projected in at least 5 images. This option reduces the noise and improves the quality of the point cloud, but it might compute less 3D points in the final point cloud. It is recommended for oblique imagery projects that have high overlap. 6: Each 3D point has to be correctly re-projected in at least 6 images. This option reduces the noise and improves the quality of the point cloud, but it might compute less 3D points in the final point cloud. It is recommended for oblique imagery projects that have very high overlap. Note: When the point cloud classification is used for the DTM generation, it significantly improves the DTM. Allows the user to select the desired output formats for the Point Cloud. Note: It is possible to select more than one format in order to save the Point Cloud in multiple formats. When no output is selected, only a .p4b file is generated. This is always generated, but it can only be opened in the rayCloud of the Pix4Dmapper. LAS (default): LiDAR LAS file with X,Y,Z position and color information for each point of the Point Cloud. LAZ: Compressed LiDAR LAS file with X,Y,Z position and color information for each point of the Point Cloud. PLY: PLY file with X,Y,Z position and color information for each point of the Point Cloud. XYZ: ASCII text file with the X,Y,Z and color information for each point of the Point Cloud. Merge Tiles: If the point cloud consists of many points, several tiles are generated. This option produces a single file with all the points. For more information about the file formats and the software with which these files can be opened: Pix4D outputs with other software > by output. How many Points are generated during step 2. Point Cloud and Mesh?